COPE Galway is calling on all Galwegians to once again don the t-shirt and togs and brave the cold Galway Bay Water on Christmas Day in order to raise much needed funds for the local charity. Community Fundraiser for COPE Galway, Lynia O’Brien said the swim has become a real tradition over the years with hundreds meeting up every year with friends, family and neighbours at Blackrock on Christmas Morning and taking the plunge together. It has become such a popular event for Galwegians, especially those who are home for the festive period. The COPE Galway Christmas Day Swim raises money to help fund the organisation’s Homeless, Domestic Abuse and Senior Support Services in Galway. In 2017 COPE Galway worked with 695 single people and 242 families, including 576 children who were homeless, or at risk of homelessness. COPE Galway’s Domestic Abuse Service supported 339 women with 214 children who were experiencing domestic abuse. Community Catering prepared and delivered 41,432 meals to older people in their homes, and catered 8,360 meals for community lunch clubs. Funds from the swim will go directly towards keeping these vital services operating. 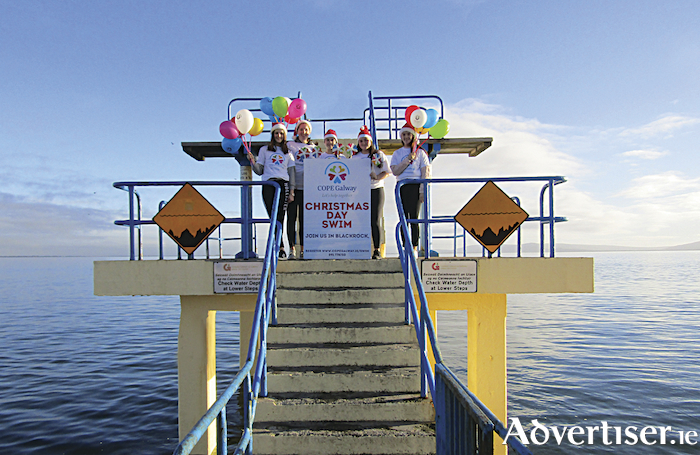 The COPE Galway Christmas Day Swim takes place at Blackrock on Christmas morning from 10am to 1pm. Register online at www.copegalway.ie/swim . Registration costs €10. Page generated in 0.2204 seconds.